The fire is still growing and is now about 7km from the nearest suburb, Kambah. Photo: Jack Mohr. 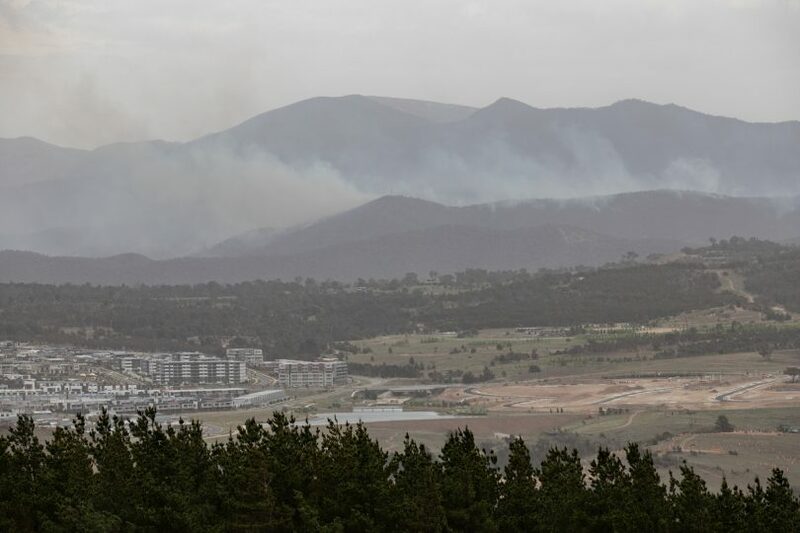 Tuggeranong residents are breathing a sigh of relief after a relentless air campaign combined with more benign conditions kept the Pierce’s Creek bushfire at bay, providing hope that it can be contained over the next few days. A storm that swept through Canberra’s south brought some respite with a few millimetres of rain and calmer conditions in its wake. 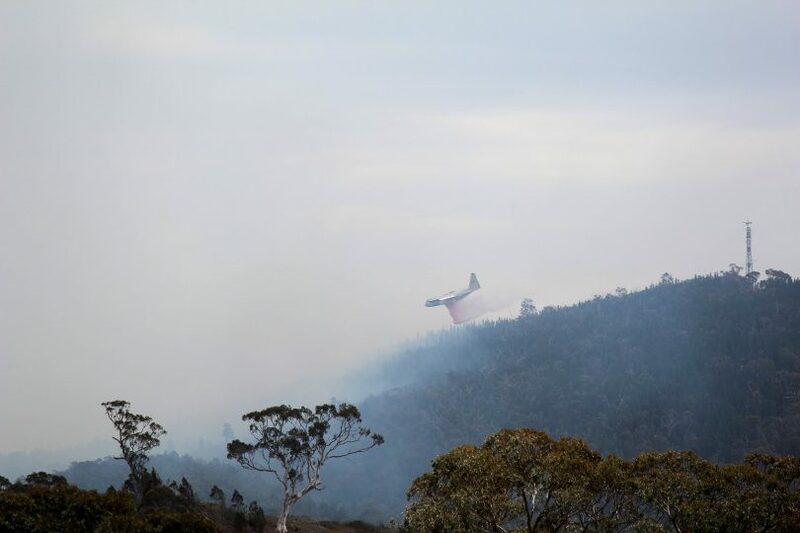 The fire is still out of control, 147 hectares and growing and only 7km from the nearest suburb, Kambah, but without the gusting north-westerly fanning it, fire crews are hopeful they have checked its progress and will now be able to contain it. 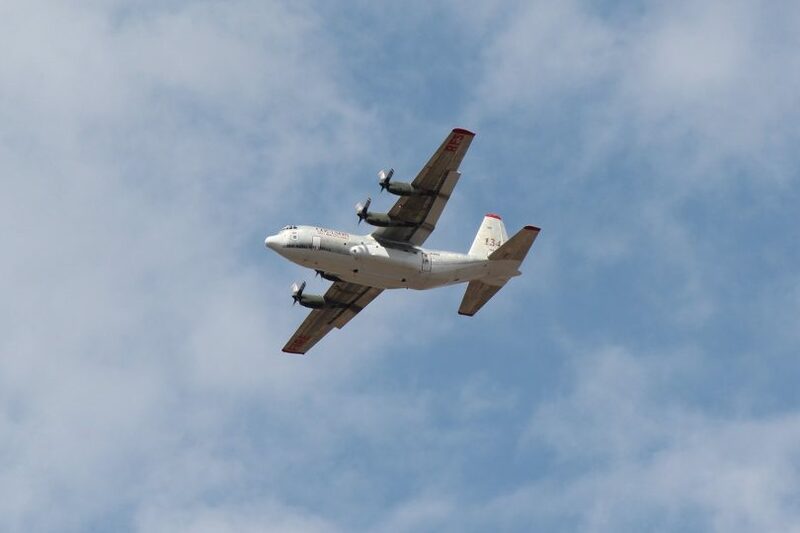 This evening they were still deploying waterbombing helicopters, while the NSW air tankers had proven especially effective at keeping the fire where it is. The Emergency Services Agency said there were 10 crews on site and they would do backburning overnight. Graders and bulldozers had also been brought in to cut trails and strengthen containment lines. The alert level had been downgraded from Watch and Act to Advice, meaning that while there was still a fire, there was no immediate danger to the community. Emergency Services Agency Commissioner Dominic Lane said crews would work hard over the next 12 hours to contain the fire. Milder, less windy conditions mean there will not be a Total Fire Ban on Saturday, although the Fire Danger Rating will still be Very High. Firefighters battled all day on Friday to prevent the bushfire, which started on Thursday from a burnt-out car, breaking out and racing to Tuggeranong’s suburban edge as conditions played havoc with their ability to contain the blaze. 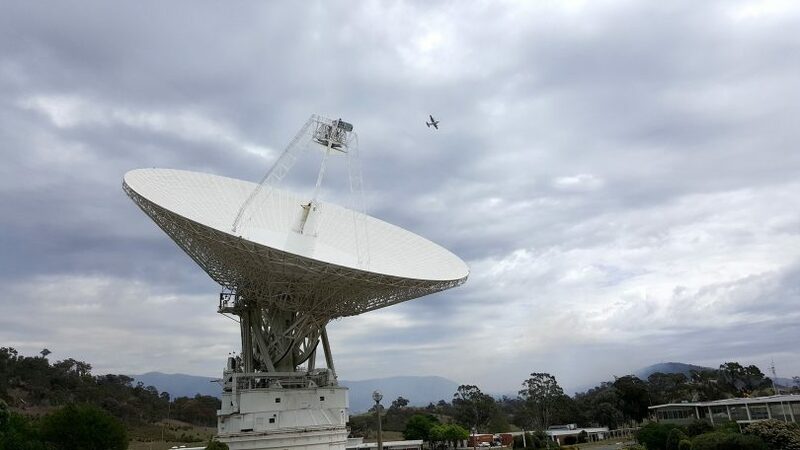 The fire at Pierce’s Creek in the south-west of the ACT is burning in steep and inaccessible country with about half a dozen farms and the Tidbinbilla Deep Space Communications Complex in its path. 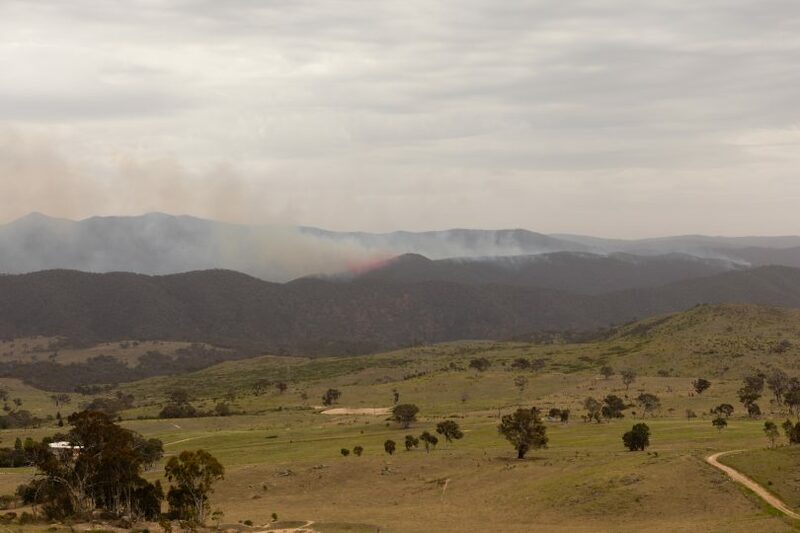 It was fanned by strong and unpredictable winds and fuelled by tinder dry conditions reminiscent of the catastrophic 2003 bushfires that devastated the western edge of Canberra. LIVE from Region Media HQ with the latest update on the bushfire. Mr Lane said earlier that firefighters had not been a position to directly attack the fire and had focused on protecting property and preparing the community for any deterioration in the situation. “We saw overnight even at 2 o’clock in the morning flames at treetop height, and whilst firefighters tried bravely to get in and contain the fire it was just too dangerous,’’ Mr Lane said. He said resources had been positioned to protect farms and the Tidbinbilla complex. “If it breaks out on to open farmland we have resources there to stop it but what I’m particularly concerned about is if we do get that spotting activity that could spot well in advance of the main fire front,’’ he said. That would make it almost impossible for firefighters to stop the fire before it hit the urban edge. Mr Lane said resources included Parks and Conservation, Rural Fire Service, ACT Fire and Rescue personnel, and more than 400 colleagues from NSW. There were 21 fire appliances, supported by five helicopters waterbombing the fire and providing aerial observation, as well as the two large air tankers from NSW. He said much depended on the weather. “Whilst we’ll see some slightly milder weather tomorrow, we’ll be back into very high and possibly severe fire weather by Sunday. This not over by any means and because it is so dry firefighters have a lot of work to do here,’’ Mr Lane said. Police and Emergency Services Minister Mick Gentleman said the ESA had the full support of government and was throwing all available resources at the fire. He urged Tuggeranong residents to be alert and bushfire ready. Volunteers doorknocked between 400 and 700 homes from Kambah to Gordon this afternoon in an exercise to educate people about what the fire threat alert levels mean, their current bushfire plan and what materials are available to them via www.esa.act.gov.au. The ESA said no evacuations had been ordered for residents, horses or other animals, and as yet there was no threat to property. But people, particularly those in Bushfire Prone Areas, should activate their bushfire plans, monitor ESA updates on its website, and listen to ABC radio. “It is important residents start thinking about their bushfire plan and be aware of the bushfire alert levels so they can take appropriate action as firefighters continue work to extinguish the fire,” the ESA said. A Total Fire Ban was declared for the whole of the ACT on Friday, and the Fire Danger Rating (FDR) was Very High. One hundred and fifty primary school children from Miles Franklin School were evacuated from Birrigai Outdoor School by bus this morning. The ACT Government closed Kambah Pool and Kambah Pool Road. Camp Cottermouth is also closed until further notice. The Tidbinbilla and Namadgi Visitors Centres remained open. All public inquiries regarding bushfires and emergency management should be referred to the ACT ESA on 6207 8444 or at www.esa.act.gov.au or to Access Canberra on 13 22 81 or at www.accesscanberra.act.gov.au. 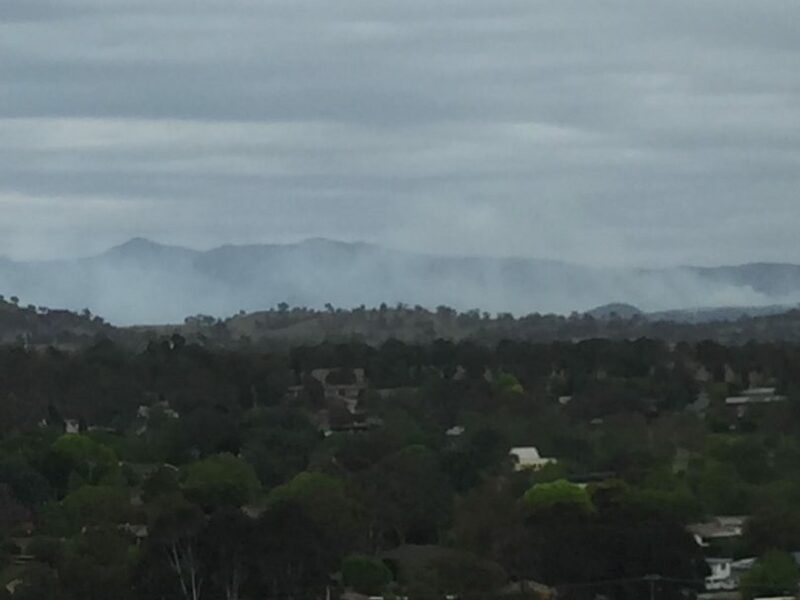 If you have any images of the Pierce’s Creek bushfire that was taken from a safe location, please share them with us in the comments section below or on our Facebook or Twitter pages. Thank you Mr Lane and all the hard working fire fighters, RFS & SES – the community is in debt with your courage & long work hours to keep us all safe. Please let us know what we can give back to help you all. Congratulations to RiotACT, Reddit, Facebook and Twitter for keeping us informed today. I’m disgusted at how 2CC continued with wall to wall Sydney shock jocks and virtually ignored the deteriorating conditions throughout the day. Even in their Canberra shows during breakfast and drive there was precious little information. I listened to their drive show this afternoon eager for news about the fire and they were talking about caravans and grey nomads. Pathetic. ABC have had updates every 15 minutes, albeit still on normal programming. It is one reason why many people want the ABC kept the way it is, including many typical right wing voters as there are no commercial interests to keep happy. Listen to Canberra ABC 666 – much better! I feel very nervous even though there are rain clouds on the radar. I don’t believe the ACT has enough resources to deal with this fire. While they don’t have full control of the fire, they’ve contained it to the forest for the time being. Also NSW is helping out, they are tackling it a multiple of ways, including dropping fire retardant to create containment lines. They’ve blocked off all the forest in and around Canberra including Kowen and Googong, so that no idiots can start another fire, so all resources can focus on this one. They’d also rather have people nervous and knowing about the potential threat, than not knowing and oblivious to the threat. IMO they have learnt from 2003 and are doing things much better this time around. Can people please be considerate as well with regards to water. If you are not living a house or two from the nature reserve, please don’t have sprinklers etc running on your roof. All this does is remove water pressure from those first in line to fight the fire. It happened in 2003 and I had a dribble coming out of my hose. Luckily the fire brigade rocked up a minute later and saved my home. If houses start to burn that sprinkler on your roof won’t save you. The intensity of the heat from the burning houses will evaporate the water so quickly it will do nothing.